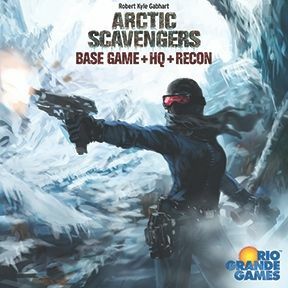 This week we are reviewing Arctic Scavengers, a game we bought earlier this year during a Boxing Day Sale. We bought this game knowing very little about it but loved the theme. The game is based in the future in a post-apocalyptical world. Each player takes the role of a tribe of scavengers trying to collect food, supplies, and medical equipment in order to entice more people (cards / victory points) to join your tribe. These tribes then fight at the end of each round, the winner collecting a card that gives them better resources or bigger tribes. The game is played in a total of fourteen rounds, where the winner is the scavenger with the biggest tribe. We tried this game for the first time a couple of weeks ago, and rather enjoyed it. This game plays very similar to Dominion. It is a deck building game, where players gather resources to buy better cards and victory points. While on the surface this game is very similar to dominion, there are a few things that are different/interesting. 1. You battle other players at the end of each round. Players are faced with the option to buy more/better cards during the initial phases or keep cards for the last phase of the round to win better cards worth more victory points. 2. Another interesting mechanic is the "dig" for resources option. During each round players can either buy new cards or dig in a common pile referred to as the junk pile. This is great thematically as some cards are awesome resources while others are useless junk. The more players dig, the less likely players are going to get useful equipment, this seems very fitting in a post-apocalyptic world. This game played really well the first time we played it, and we haven't played with the expansions yet but it seems like the game wouldn't have as much re-playability as a game like Dominion. Unlike Dominion the draft cards are standard every game. Overall we really enjoyed this game. While the mechanics didn't cover anything new to the board game world, the combination of the mechanics in a single game made for a more interesting and interactive deck-building game than others. I would say that this is one of the best deck building games that I have played. We have not played the expansions yet but I know that it will make it to the table again soon and I look forward to playing it.